You must log into your CIES membership account through the CIES website. Once you are logged in, select Manage Profile. On the Manage Profile page, select Membership, which is under the section titled "Invoicing, Payments & History." From the membership page, your CIES membership status will be reported. To see if your SIG memberships have been renewed, look on the right navigation bar under My Profile and select Groups. The Group page will show the SIGs you belong to (see example below). If you don't see the Higher Education SIG listed under Group Type, go to Special Interest Groups under "Group Permissions". The Special Interest Groups page lists all the SIGs in CIES. The SIGs are listed alphabetically. 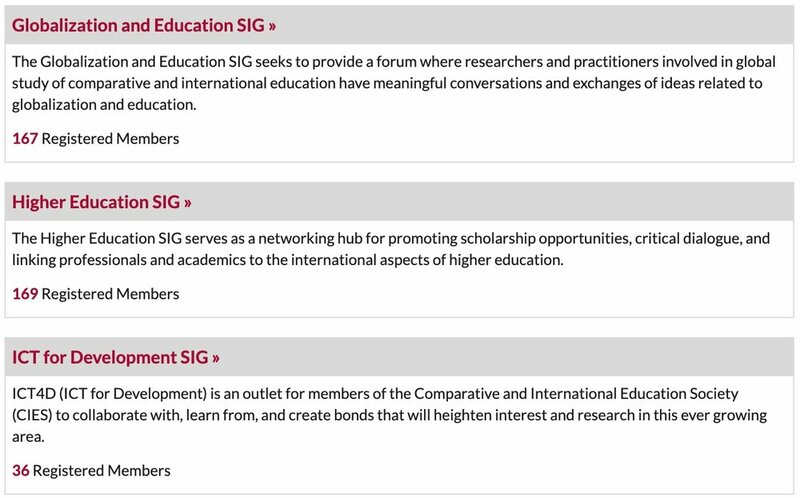 Once you find the Higher Education SIG, click on it to go to our group page. The group page will allow you to add/renew your membership, only when you join as a new CIES member or when you renew your membership subscription. During these times, click the "join group" icon directly underneath the Higher Education Special Interest Group header at the top of the page. You can go to the members online store, in the Members Area section. There you may purchase or renew a SIG membership.